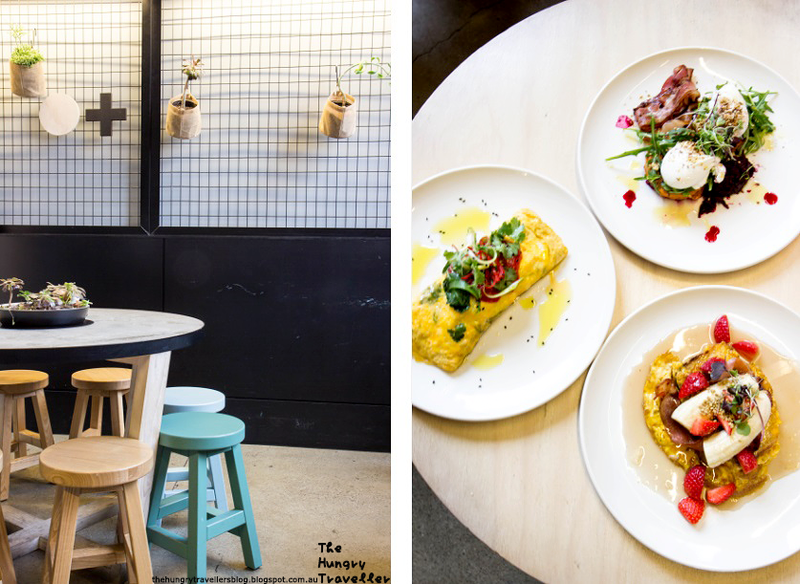 I'm always curious about trying different types of foods, particularly healthy foods, so I was excited to try out Patch Cafe when they extended a dining invitation to me. Patch offers a menu with lots of healthy and colourful Paleo dishes. What is Paleo food, you might ask? It's a diet based on eating the wholesome and nutritious foods that our hunter gatherer ancestors ate during the Paleolithic era. While I'd heard about Paleo diets from friends and other bloggers before, I'd never tried any specific Paleo dishes in the past...so I really wasn't sure what to expect when I arrived. However, the staff at Patch Cafe were very friendly and helpful, and I was soon offered a number of drinks. We sampled some vegetable juices, which had strong veggie flavours before trying an almond milk chai latte. 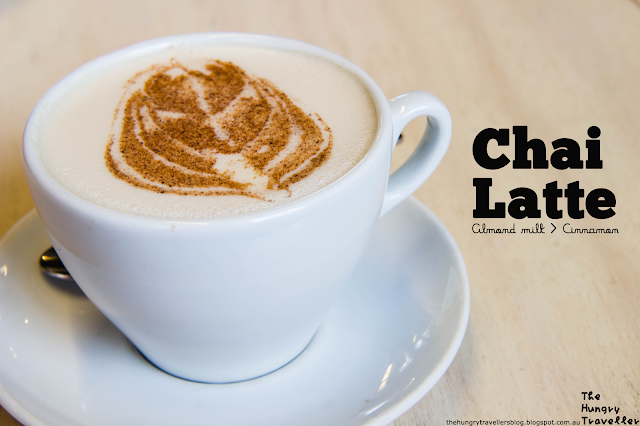 Frothy and warm, with some nice cinnamon latte art, it was the perfect way to start a meal. It took awhile for me and my good friend, and dining companion, Nhu, to decide on what we wanted to eat. I think it's hard when you're a foodie because everything sounds good and you only have one stomach! Nhu ended up settling for a Hash Stack, while I opted for a Spanner Crab Omelette. Yes...another crab dish. I guess I can't really go past crab when it's on the menu! We also decided to share a French Toast, made with Patch's special Paleo bread. Nhu's Hash Stack looked amazing. 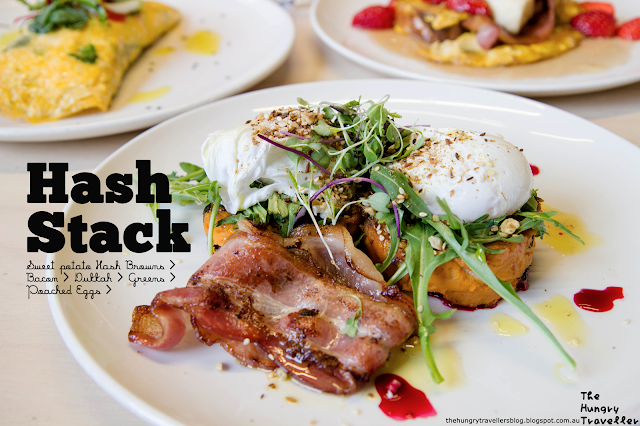 To dissect the dish, it was two poached eggs with dukkah, sitting on a bed of rocket and two sweet potato hash patties with bacon on the side. Sounds like the perfect combination right? I have to admit I had a bit of food envy when I tried the dish because the eggs were perfectly poached with lots of dukkah flavouring, the sweet potato patties were soft and sweet and the beetroot chutney was refreshing. The patties could have been crispier on the outside, but they provided a tasty staple to go with the bacon and greens. Nhu also said that this was the first time she'd actually enjoyed beetroot, so I'd say that the beetroot chutney is pretty winning at Patch Cafe! My dish was also delicious. 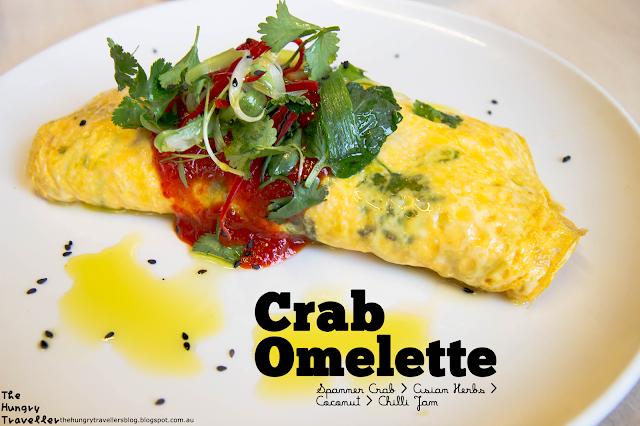 Spanner crab and coconut wrapped in a giant omelette served with Asian herbs and chilli jam. It was exotic. I really liked the plump chunks of tender Spanner crab meat that would fall out from the omelette as I cut away. So fresh and satisfying. The omelette was tasty and filling and made more exciting by the sweet and spicy chilli jam, coconut and Asian herbs it was served with. It felt like something I would have tried in Thailand. I'd really recommend this omelette! But make sure you order a latte with it because that chilli jam can be a bit too exciting if you accidentally get too much on your fork. 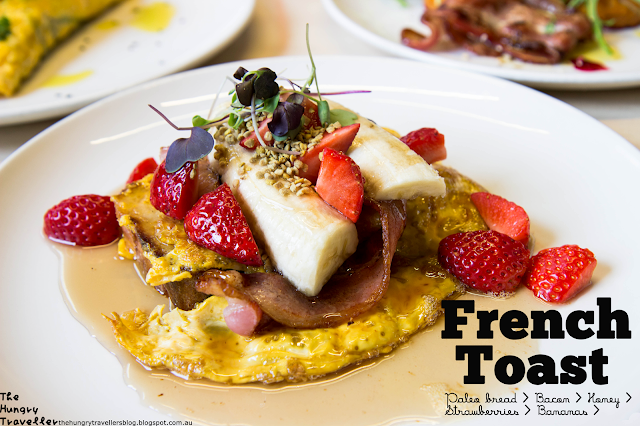 We finished the meal with Paleo French Toast, which was Paleo bread dipped in egg and served with bacon, honey, strawberries and banana. The Paleo bread had an interesting texture. It was thick, spongy, dense and a little dry. It wasn't the type of bread I was accustomed to, but I think it would excite those who follow a Paleo diet because it's freshly baked by the crew at Patch and the loaves look and smell wonderful on the counter top! We had finished our meal and were chatting casually about the things that had happened that morning when the staff kindly brought out a platter of house-made raw desserts - a caramel slice, a rum ball and a slice of cheesecake. I was excited because I have a sweet tooth and I've always wanted to try healthy desserts made from nuts and fruit (and dark chocolate). 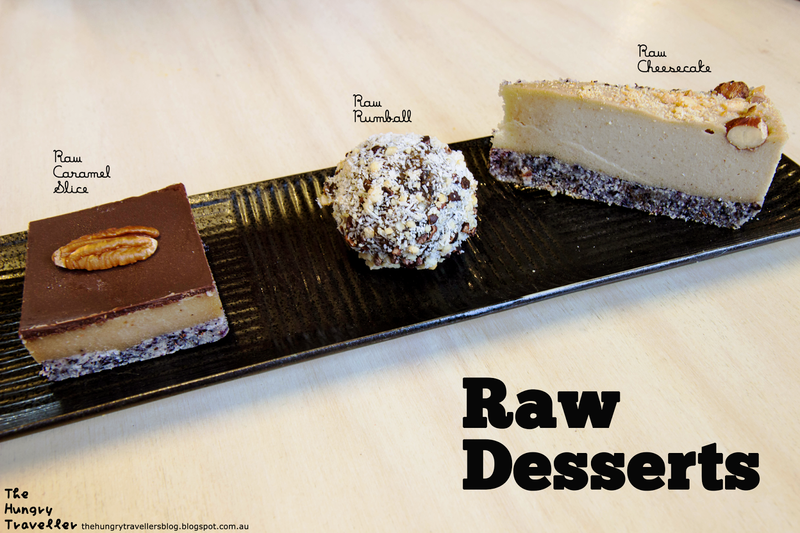 My favourite was the raw caramel slice. It surprised me how much it tasted like an ordinary caramel slice. The dark chocolate and fruit 'caramel' combination was decadent and rich, but didn't leave me feeling guilty or giddy. I also liked the nutty, coconut base. The rum ball was quite sweet with lots of dried fruit, but I enjoyed the raw cheesecake with its smooth and nutty filling. 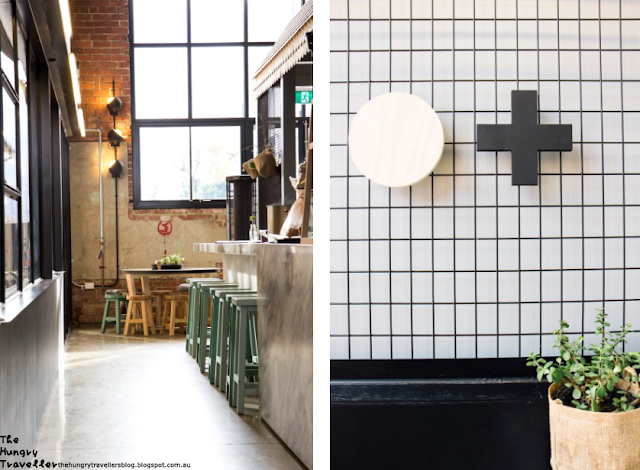 In terms of the restaurant, Patch has a lovely dining area and they also play some great tunes, with artists such as Beach House and Neon Indian on the playlist when I was there. In terms of design, the cafe is set in an industrial space, with high ceilings and long corridors, and is decked with wooden furnishings and plants. And although I didn't capture it in my photos, there's also a lot of room for outdoor dining, with a row of tables set up just outside the cafe. All in all, I had a good time dining at Patch and enjoyed being introduced to a new healthy way of eating. It may not be a diet I follow personally on a day-to-day basis, but I believe you don't have to be specifically following a Paleo diet to enjoy eating healthy and wholesome meals. 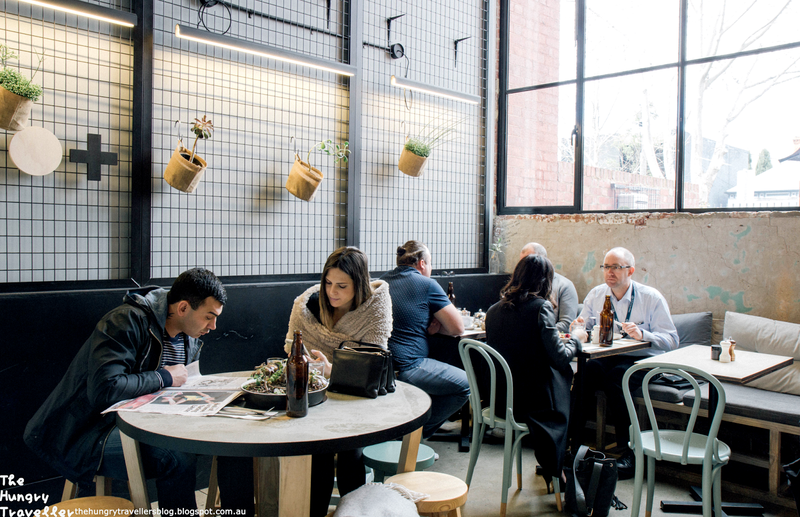 There are a lot of dishes that sound fantastic on the menu that I didn't try such as the Grass Fed Steak and the Pork Belly, so those would be worth asking the staff about. If you're interested in trying Paleo food, or just eating a healthy meal for breakfast or lunch, Patch Cafe has something to offer you. Disclaimer: I dined as a guest of Patch Cafe. This post reflects my honest experiences and opinions at the time of my visit. Please note, I'm a blogger who enjoys food and photography, not a professional critic for any particular media organisation or company. Worth Visiting? If you're looking for a healthy, wholemeal or Paleo food, this is for you!